Datamaran 4 makes possible the first ever fully automated materiality analysis. Datamaran is a powerful solution for tracking Environmental, Social and Governance (ESG) issues critical to a business. Datamaran fully automates previously manual processes undertaken by sustainability professionals for benchmarking, materiality analysis and ESG risk identification saving time, money and delivering better insights. Materiality analysis is a process used in the majority of companies, in which the non-financial issues that are most significant for a company in terms of risks and opportunities are identified, making them critical elements for decision making, reporting and strategy setting. Approaches to corporate strategy and risk management are mostly incomplete and outdated, they can also be painful, costing time and money, and often involving whole teams of consultants. Companies that have not yet thoroughly tackled non-financial issues need help to do this in the most efficient, cost-effective way possible. Through initiatives like the EU Directive on Non-Financial Reporting and the Financial Stability Board’s Task-force on Climate-related Financial Disclosures, the “materiality analysis of non-financial issues” has become a matter for the CFO and/or CRO. Now there’s a new way to do materiality analyses, and it will change the way you work forever. 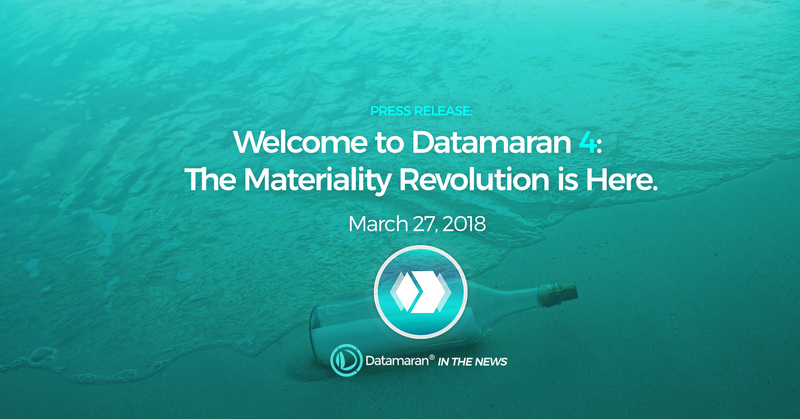 Meet Datamaran 4’s Materiality App, a game-changing technology that makes materiality: fully automated, fast and robust. The new version of Datamaran will save sustainability professionals time previously spent previously doing manual research and will provide quick high quality results. This game-changing technology will change the way companies approach their material issues and manage risk forever. Welcome to the revolution. aim of bringing a fast, cost effective and data-based approach to strategic non-financial issues identification and monitoring. news outlets and social media. Datamaran is currently tracking around 100 topics in real-time, including those related to ESG (environmental, social, governance), as well as themes such as geopolitics, innovation and technology.